The normal morphogenesis and cytodifferentiation of rodent prostatic epithelium is strongly dependent on the continuous association with mesenchymal cells of proper (i.e. urogenital) origin (1,2). The inductive capacity of urogenital stroma has been tested on different epithelia, and it was found that, in the presence of androgens, integumental epithelium was transformed by urogenital stroma into a glandular epithelium characteristic of the source of the stroma (1,3). Moreover, adult bladder epithelium could be induced to form prostate-like acini by embryonic stroma of urogenital origin (3)- From these observations McNeal (4) hypothesized that the formation of prostatic acini during the development of benign prostatic hyperplasia may be the result of a re-expression of embryonic inductive capacity. Cunha et al. 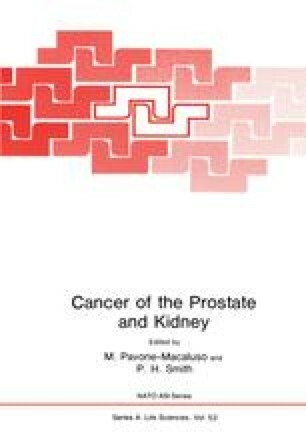 (5) summarized the prerequisites for prostatic development to be i) the presence of androgens; ii) the presence of “inductive” stroma and iii) the ability of the epithelium to respond to the inductive influences.